Memorial Day crafts are a great way to kick off summer fun and decorating. Whether your craft of choice is quilting or jewelry making, there is something for everyone to create in honor of this patriotic holiday. Afghans, pillows, and even refrigerator magnets are a great way to decorate your home for Memorial Day. After all, many areas of the country are still getting cool nights in May and June. What better way to curl up than with a patriotic afghan or pillow? This charted star afghan pattern uses a J hook and simple stitches to create a beautiful throw featuring a red, white and blue star in the center. This is a project for a crocheter with some experience and a lot of tenacity, but the finished project is fabulous. 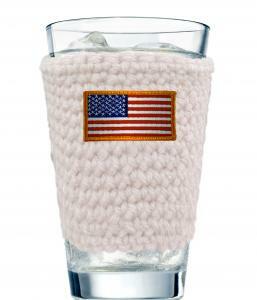 Keep your iced tea cold with this patriotic crocheted cup cozy that is easy enough for beginners. Make a set of them; the design matches the afghan above. This also uses a J crochet hook, and you can use scrap yarn to make the cozies. Once the cover is made you apply purchased appliqués in patriotic patterns to finish the look. This is really a quick, super-simple project and would be great for bazaars and fund raisers. Creating crafts with T-shirts, shoes, flip flops, and other apparel is a lot of fun for teens and adults alike. Wearing something that you have made is a great way to show the world your creative side as well as expressing your unique style. 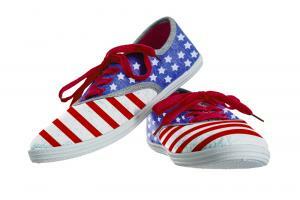 Follow the images on the site to create these memorable Memorial Day shoes in any size. Here is another stenciling project. This T-shirt has plenty of patriotism. You could even make the shoes above to match it. You will need to purchase a plain, white t-shirt in the size you need. Other supplies that you will need are listed on the website. 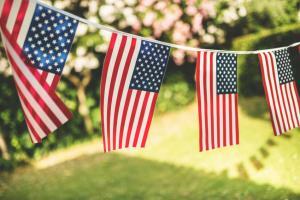 If you are planning a picnic or get together at your home, you will want to make sure your landscape is full of Memorial Day charm. 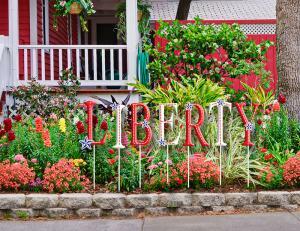 Here are a few quick and easy crafts that you can make for your yard or garden. You can make this flag banner to hang either inside or outside in a protected area like on a patio or porch. It's a quick and easy paper craft that you can put together in under 30 minutes. Memorial Day is more than the first picnic of the summer. It is a day that people are asked to stop and remember those who have given their lives in war over the past decades. Creating patriotic crafts is one way of honoring the fallen while enjoying a craft or two.